*In California, gas prices are going through the roof. The L. A. Times says economists warn that a prolonged period of elevated gas costs could harm consumers as the holiday shopping season kicks in. Analysts attributed the price surge to fuel traders’ emotional reaction after a series of refinery outages and other problems, including a Northern California refinery fire, a Southern California refinery blackout, pipeline contamination and other events. Some service stations were charging more than $5 a gallon and others stopped buying new supplies out of fear that if the market turned they’d lose money. “I haven’t seen a series of incidents like this, and it has led to the worst panic-driven rise in gasoline prices that I have seen in 35 years,” said Tom Kloza, chief oil analyst for the Oil Price Information Service. Prices are likely to set records over the weekend, analysts said, but they held out hope that the pain could end soon as fuel production problems subside. Unhappy motorists said they were caught off guard. 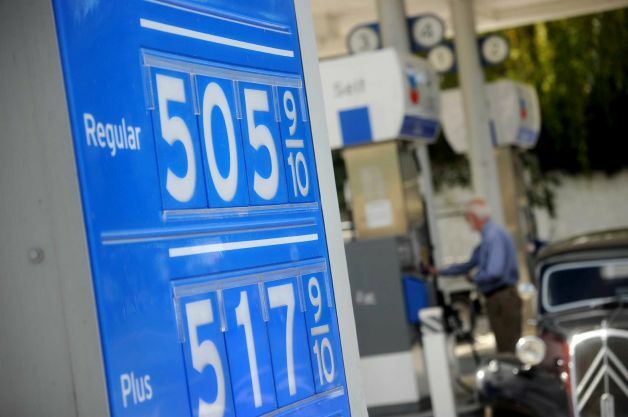 Gwen Grace, a 37-year-old homemaker, searched Friday for a price cheaper than the $4.39 a gallon that the USA gas station in Santa Monica was charging. Other nearby stations wanted as much as $5.39, so she bought $20 worth for her Prius and hoped it would last until prices begin to drop. “It’s just depressing,” Grace said. The average price of a gallon of regular gasoline Friday was $4.486, up a record 17.1 cents from the day before, according to AAA‘s daily fuel price survey. That increase had followed an 8-cent rise from Wednesday to Thursday at a time when other parts of the country are watching prices decline. Word has it that since the Exxon refinery came back online Friday the prices might start to stabilize over the next couple of weeks. I hope that is the case.